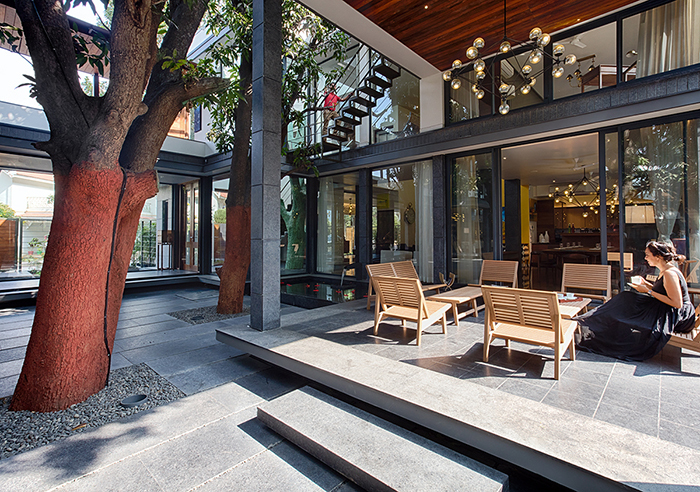 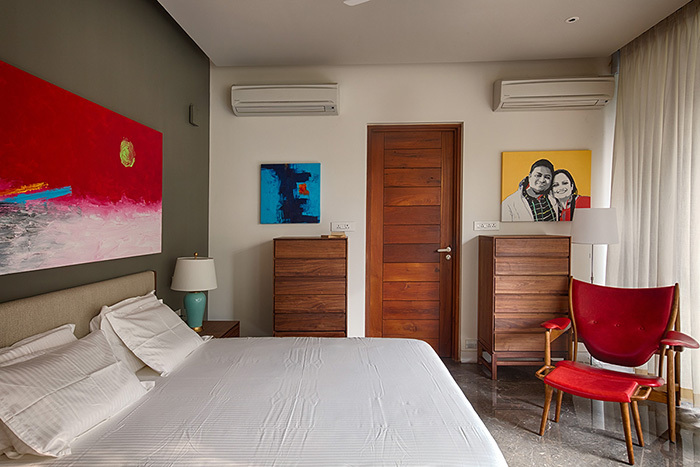 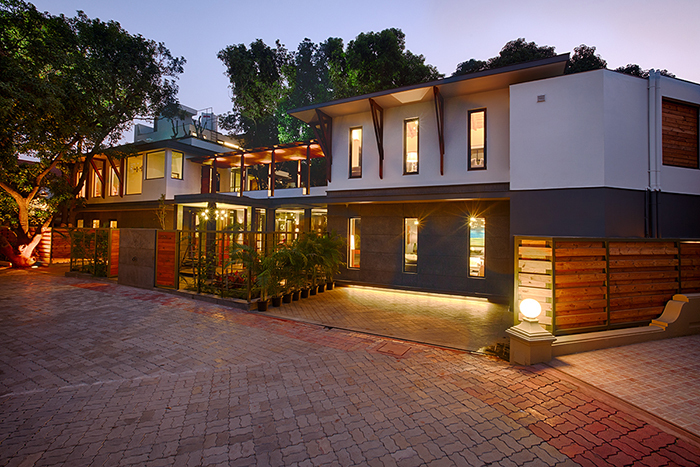 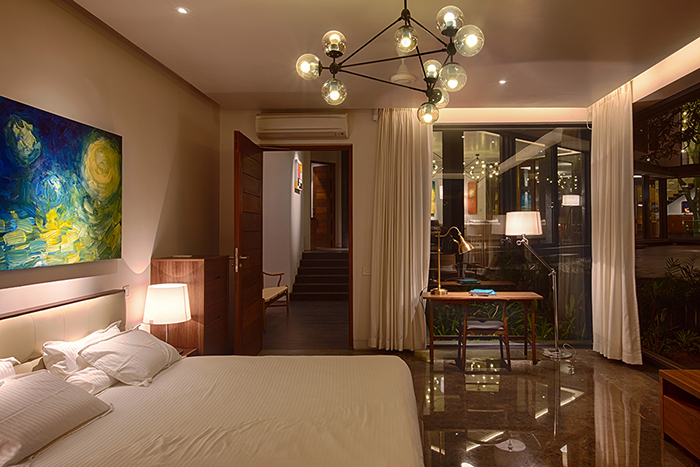 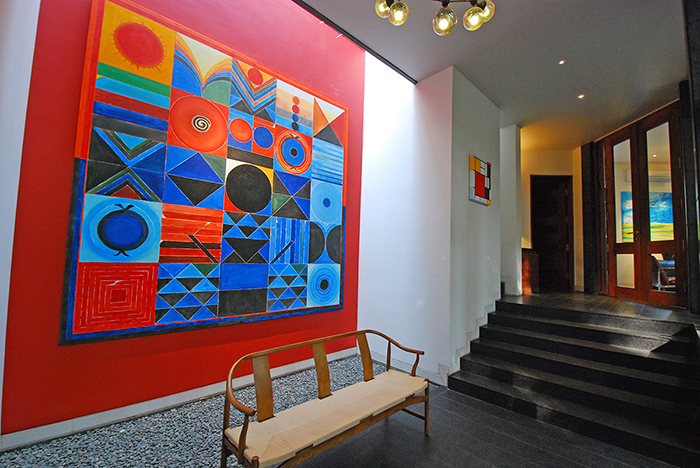 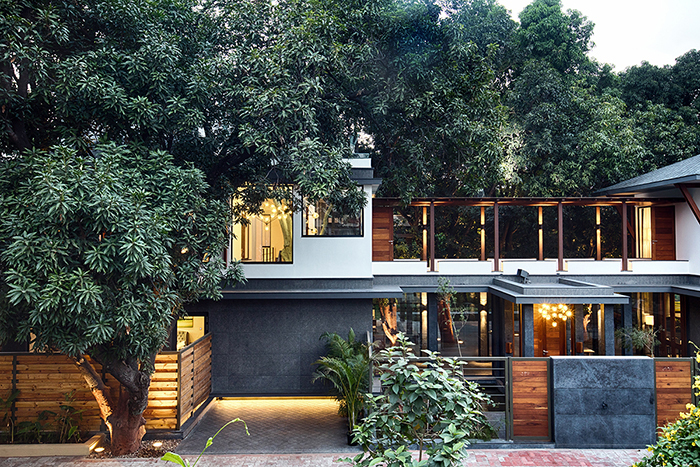 Unit 48 - The Mango Tree House, is a private residence of Mr. Jain in Bhopal-India. 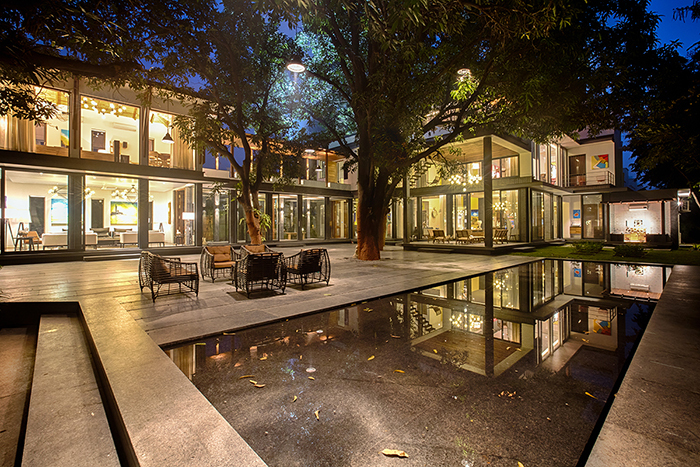 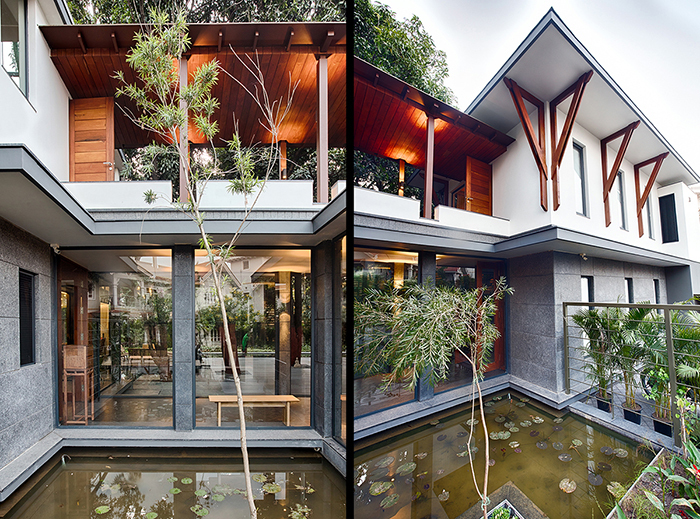 As the name suggest this house is built around several large 50 years old mango trees. 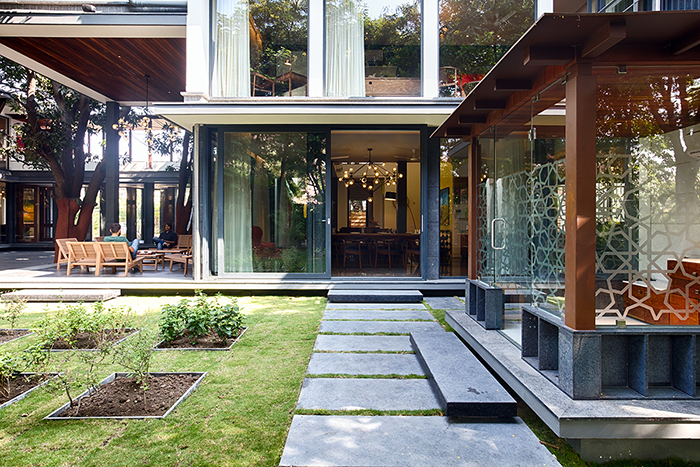 The house consists of two major blocks connected through passages. 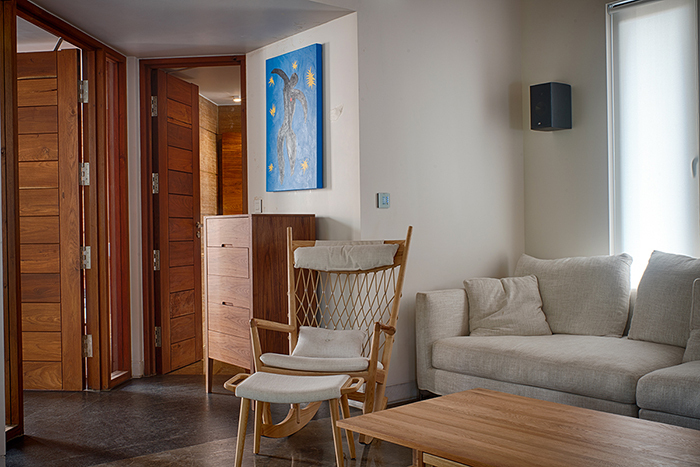 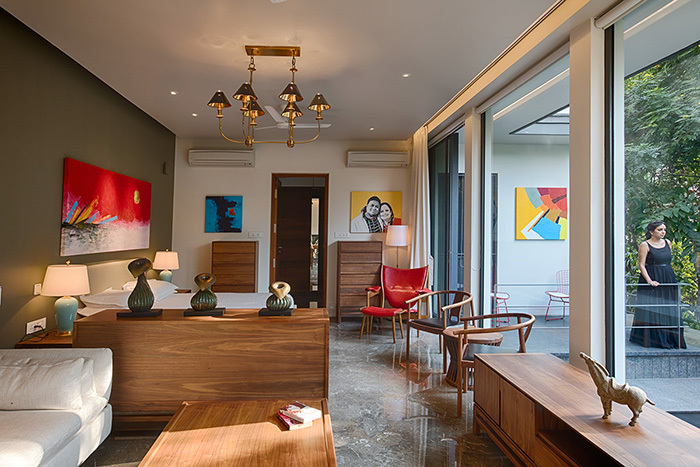 One accommodates private areas such as living room, bedrooms, kitchen & dinning - where the other accommodates formal seating, guest room, studio, gym and swimming pool. 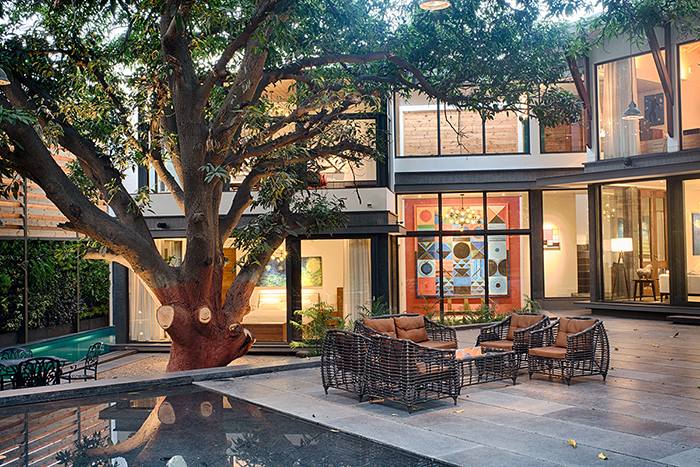 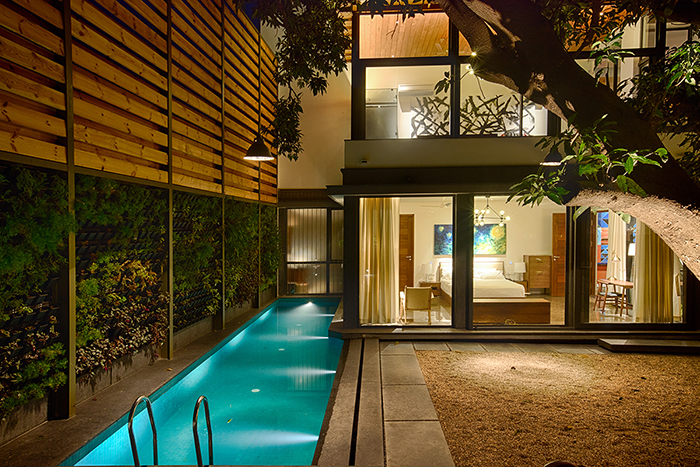 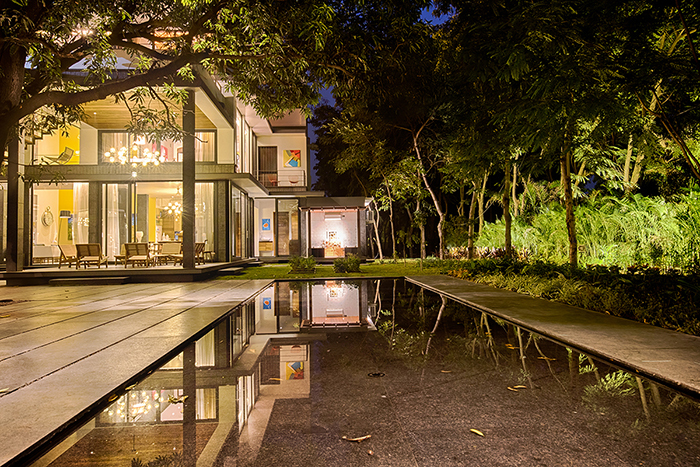 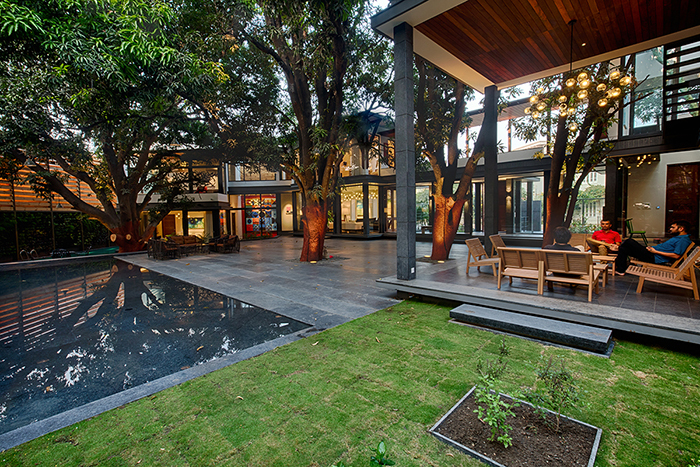 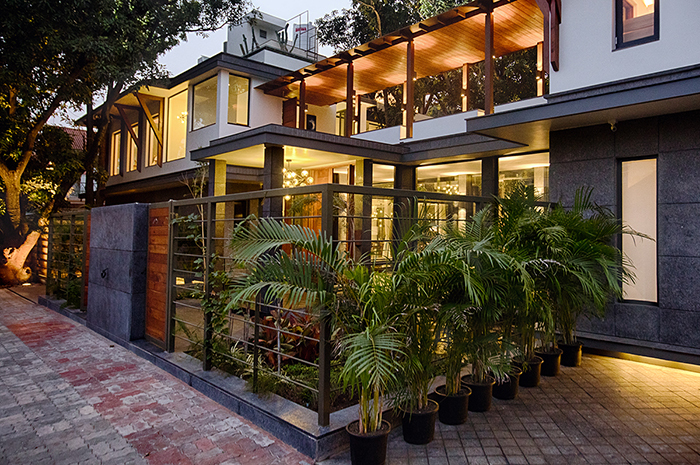 Mango trees were the most important elements of this site when we started thinking about designing this house. 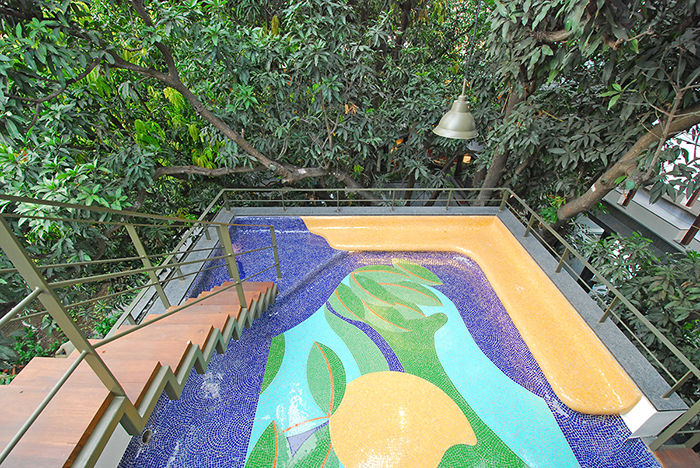 Experience of being under the large foliage of mango trees was our inspiration. 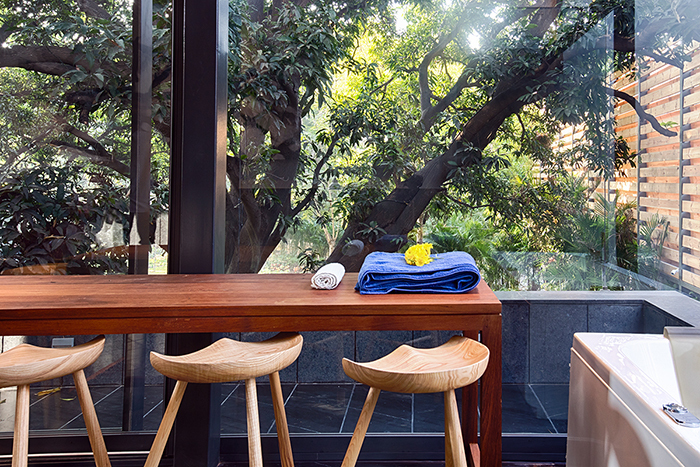 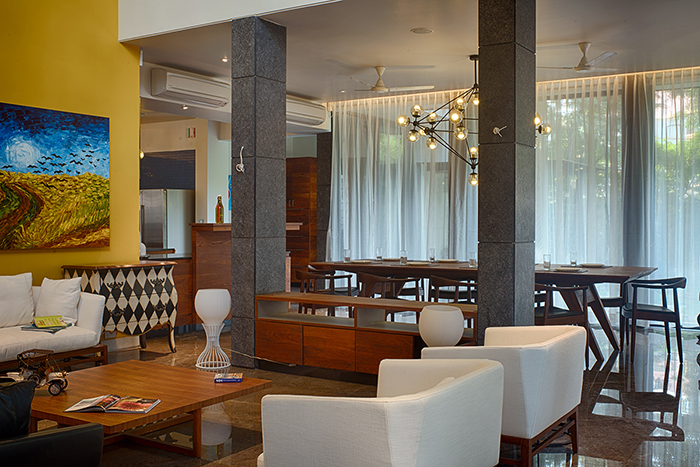 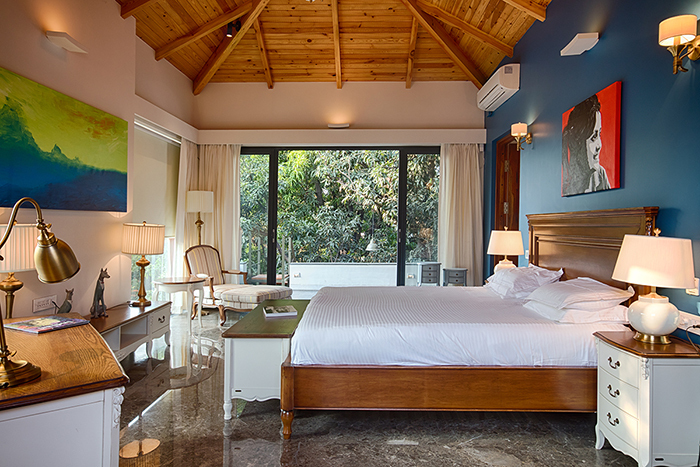 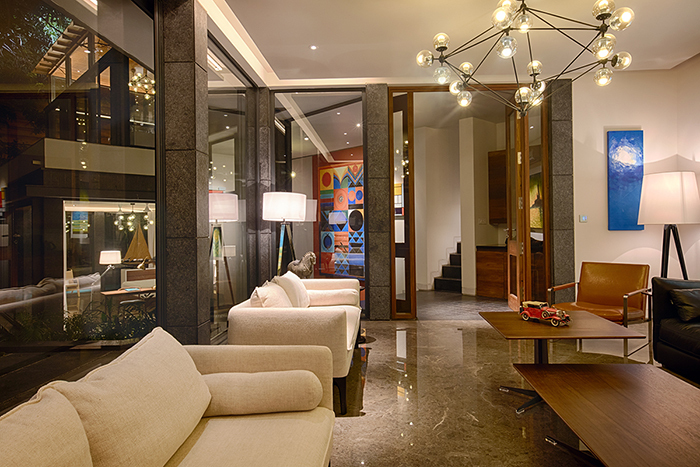 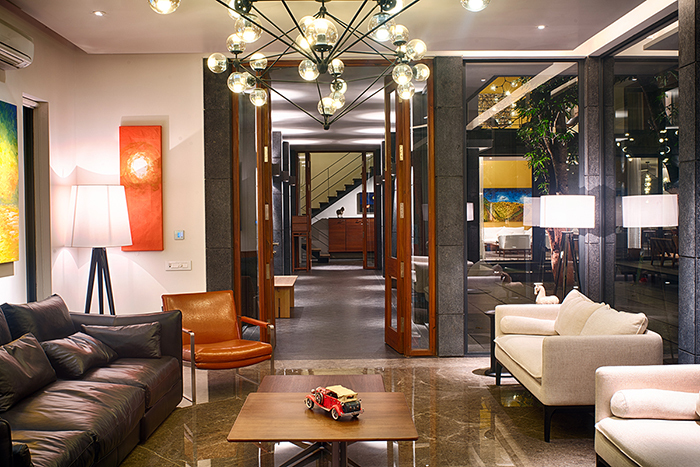 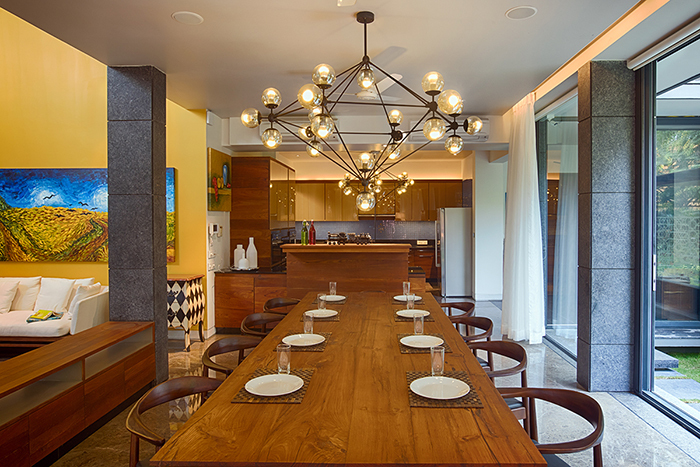 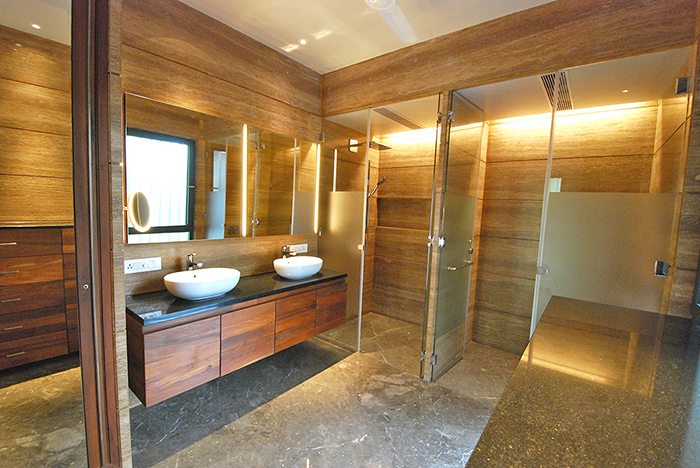 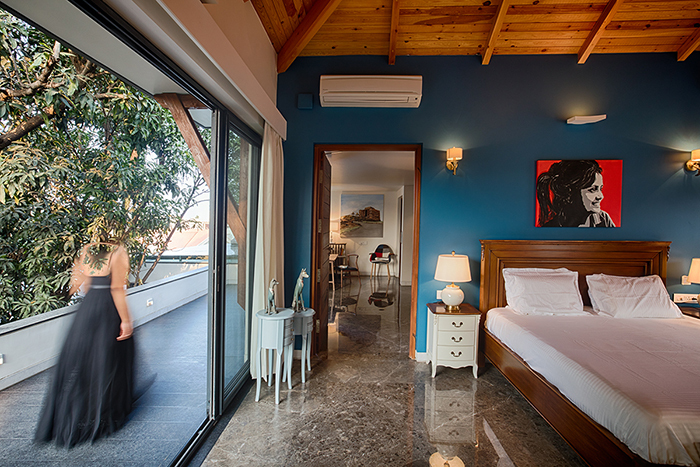 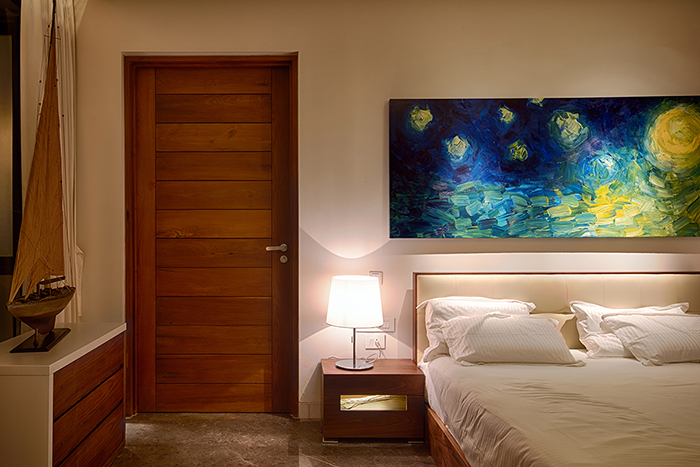 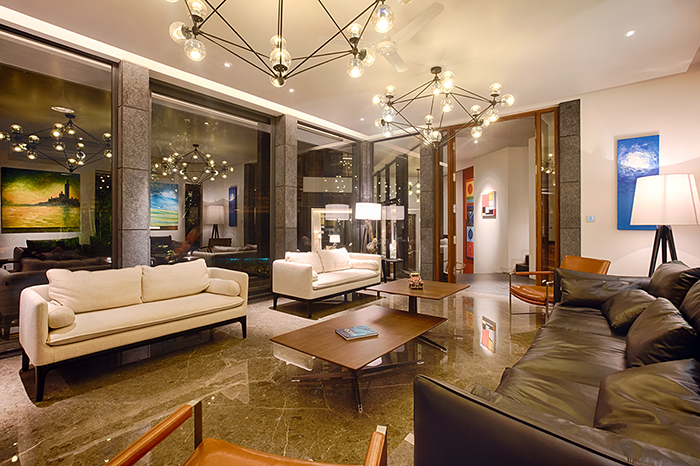 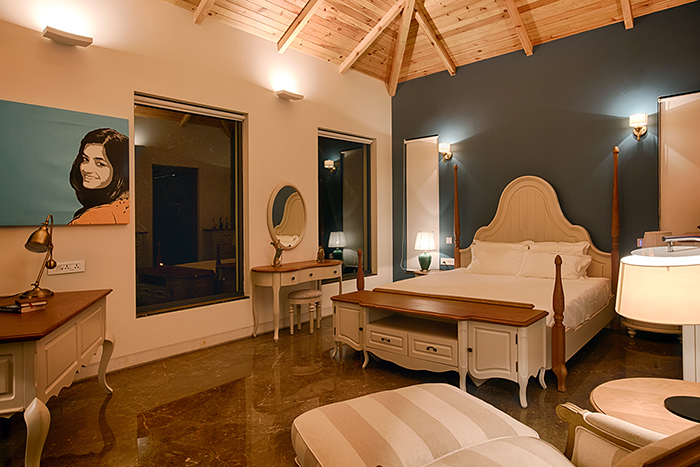 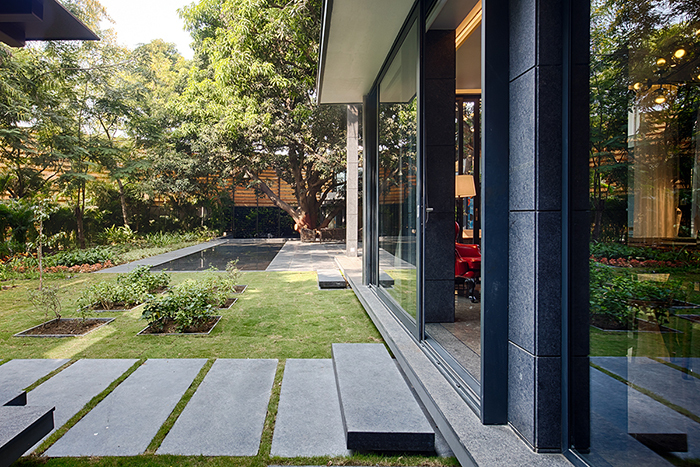 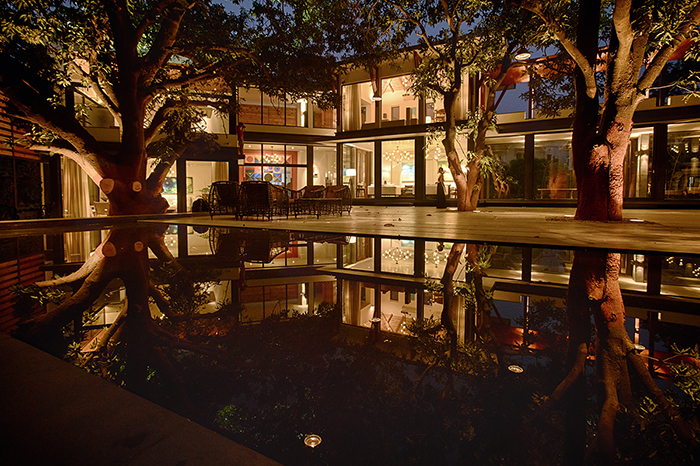 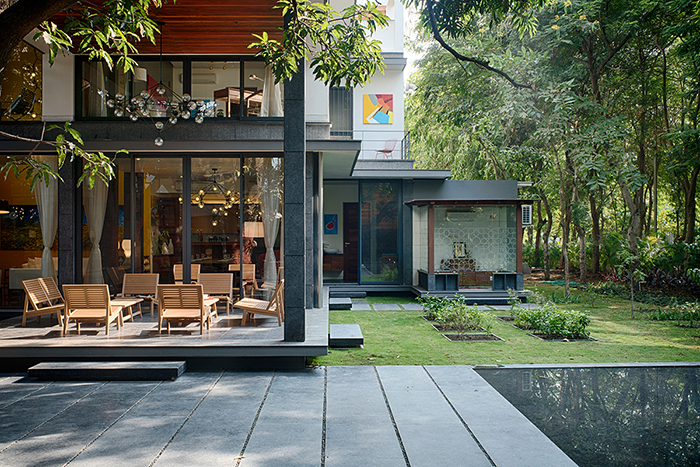 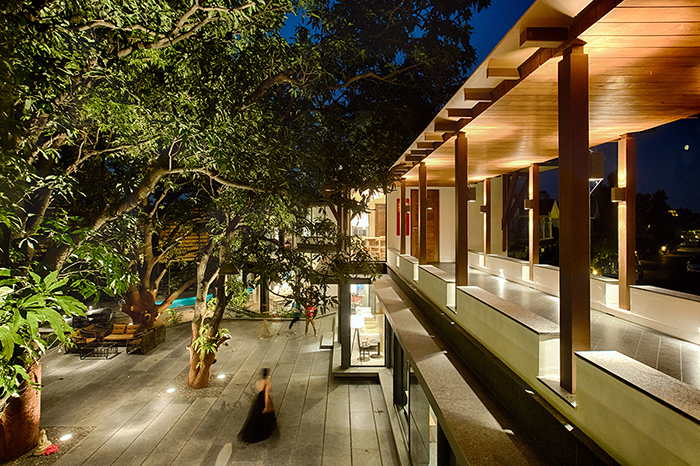 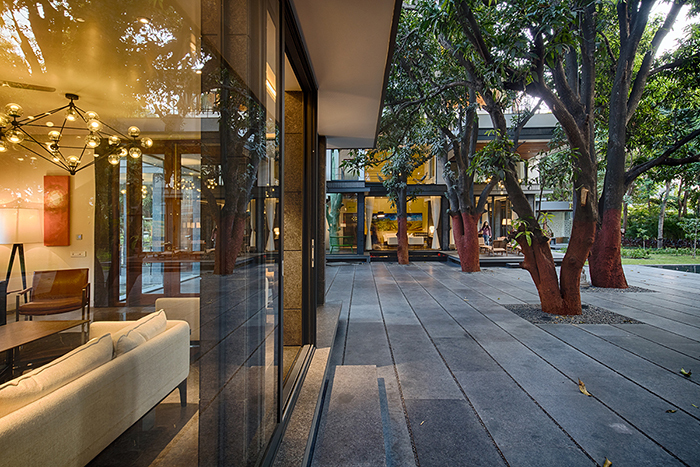 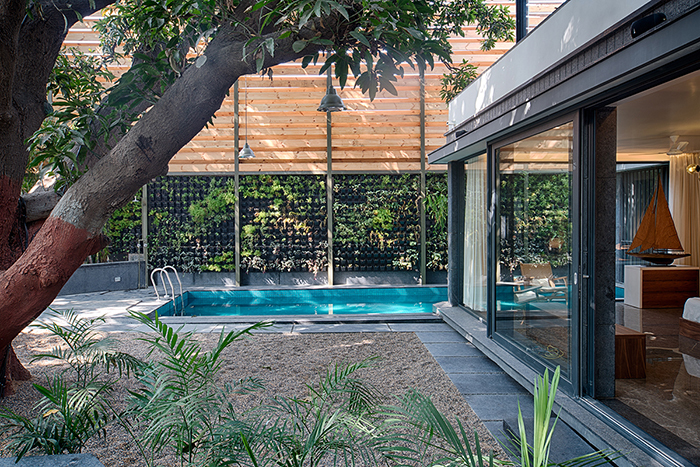 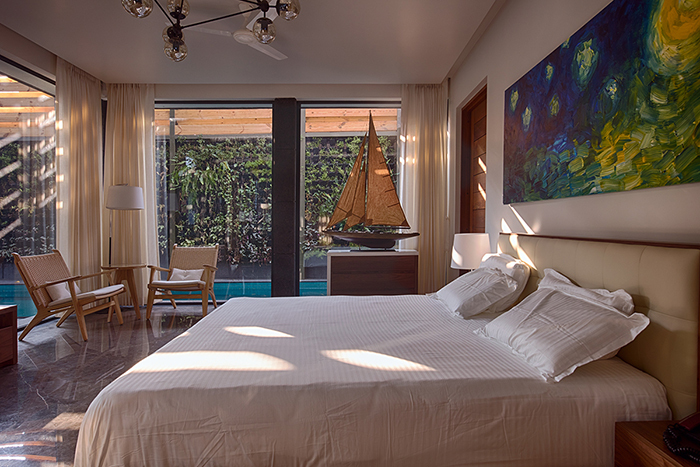 We wanted to create private living spaces without compromising the feeling of being under foliage of mango trees. 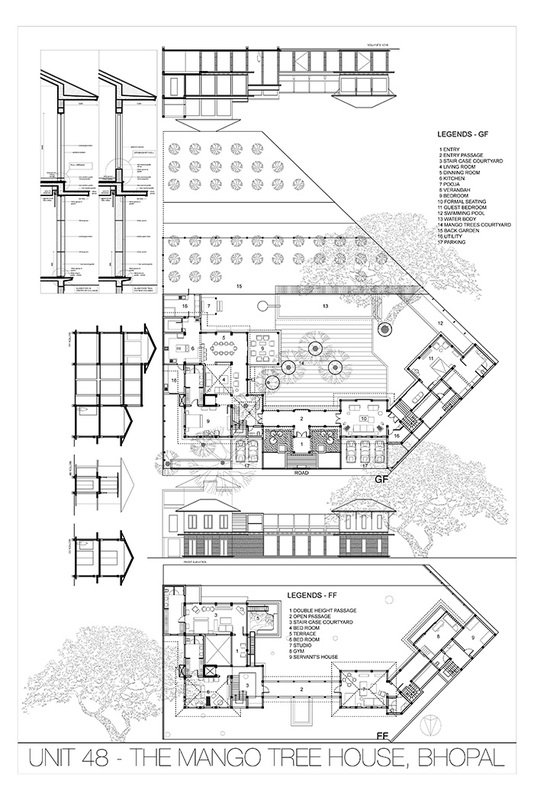 This house plan is conceived as a solid wall envelope from outside giving privacy to the house. 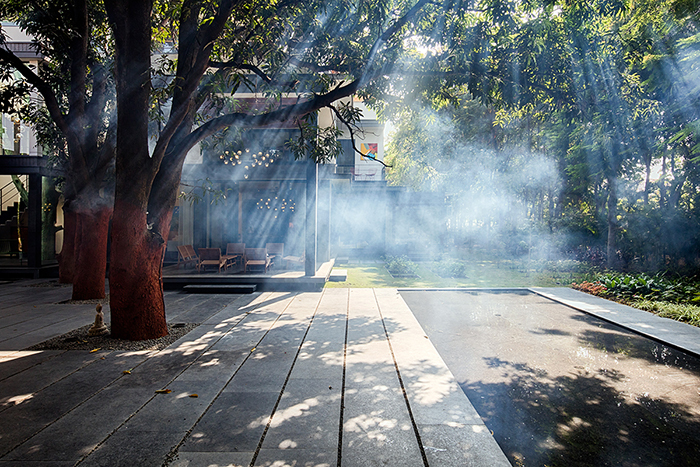 Inside this envelope all the spaces are designed as pavilions facing trees, where inside becomes outside and vice versa. 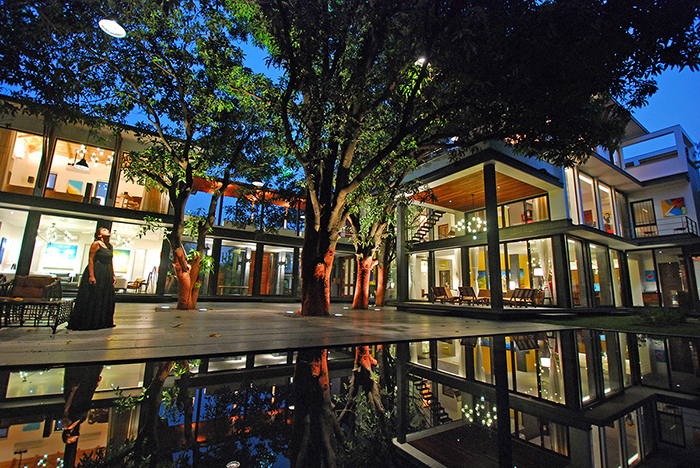 We used large glasses as transparent walls to enclose spaces, without compromising experience of being under the trees. 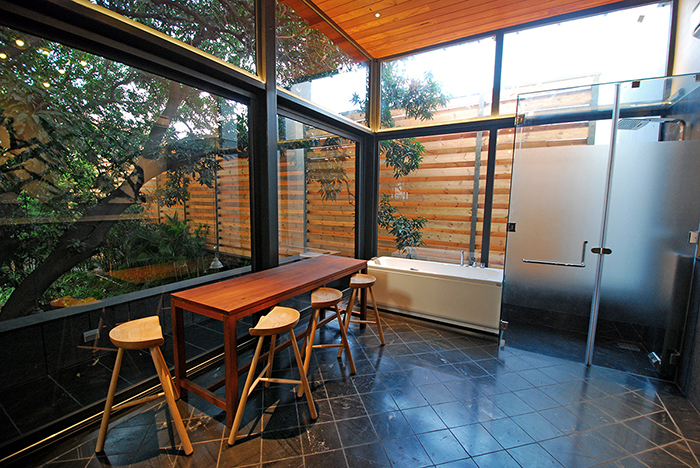 Tall openings, flat ceilings and continuous floor levels further blur the boundaries of inside and outside. 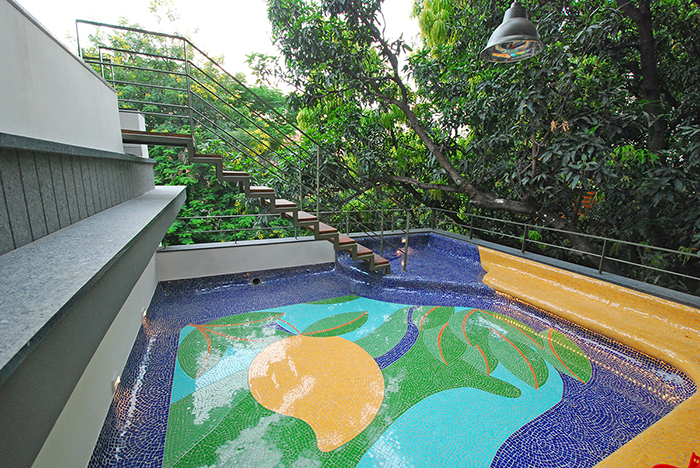 Various passages, staircases and terraces at different floor levels create new vistas and interesting movements around the mango trees. 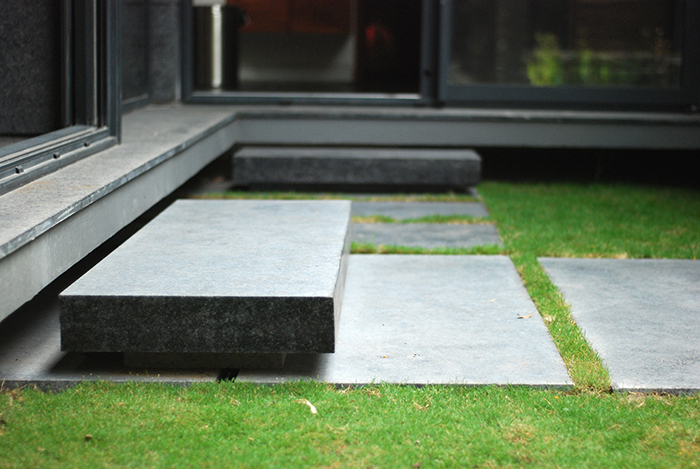 For each material, selection emphasis was again given to enhance the experience of being connected to the landscape. 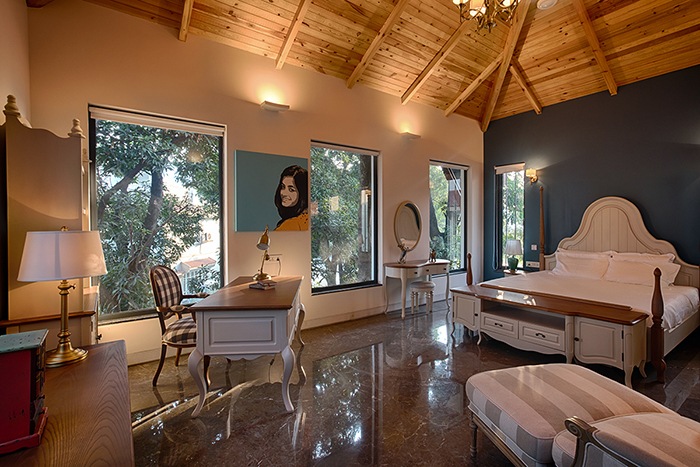 Cotton white walls and ceilings, uniform granite stone flooring prolong the experience of being close to outside. 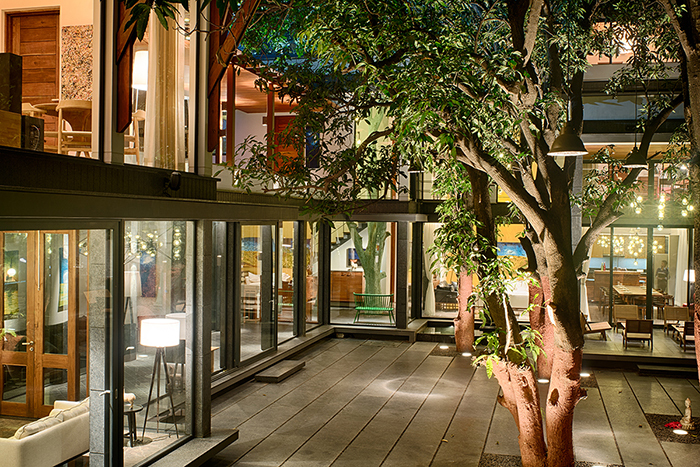 Wooden ceilings of the upper spaces merge with the tree foliage. 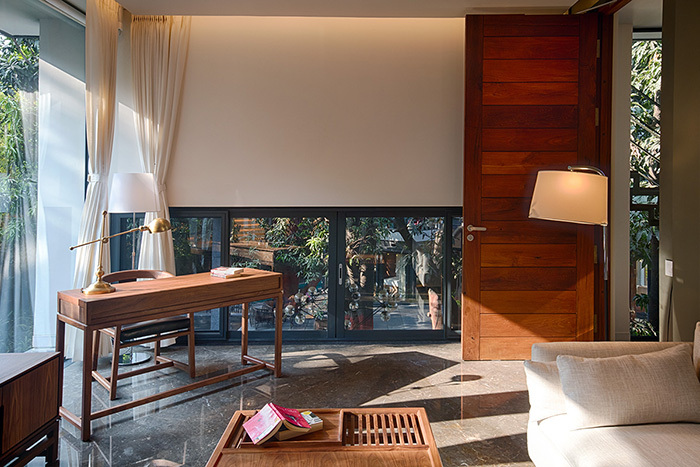 Careful selection of delicate and low wooden furniture does not interrupt openness of the plan, yet creates cozy living spaces. 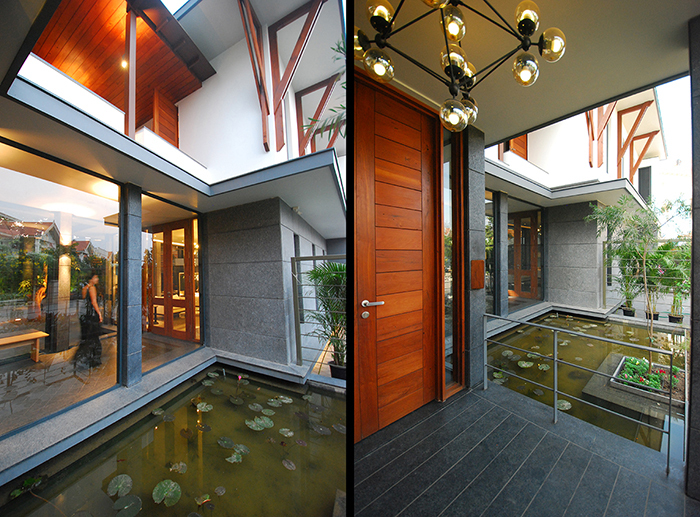 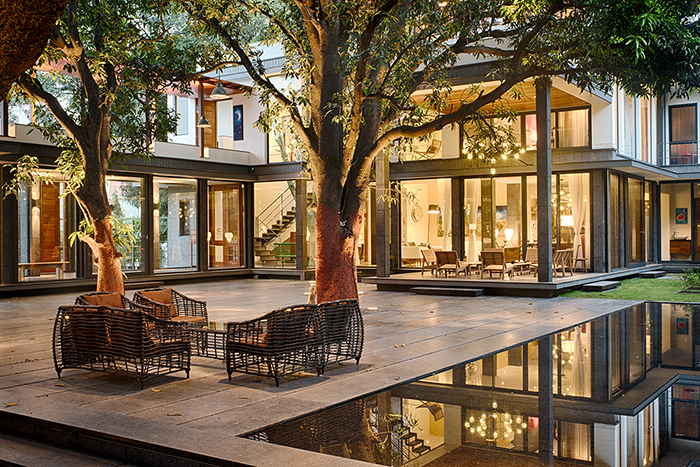 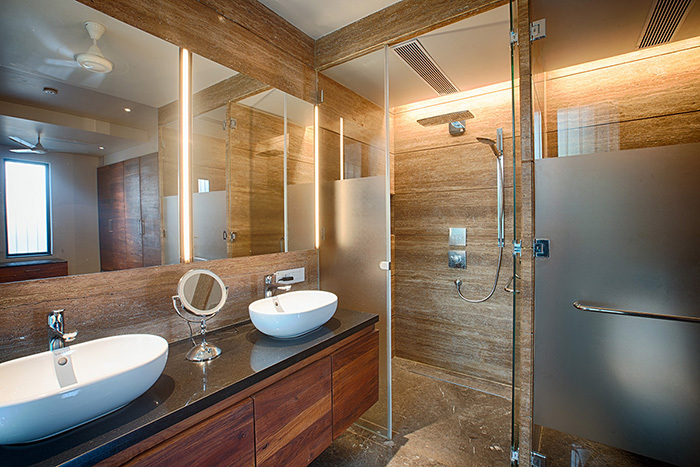 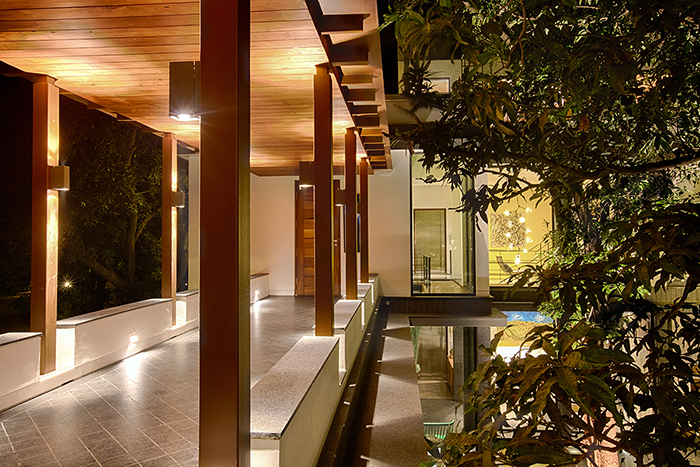 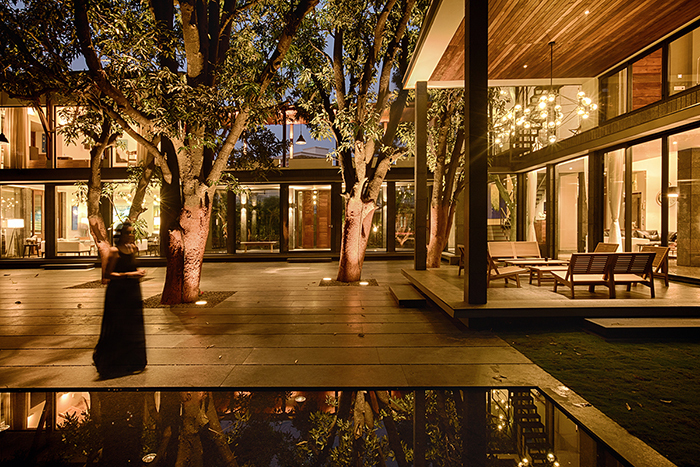 Interior and exterior lighting design emphasized the continuity of spaces towards trees. 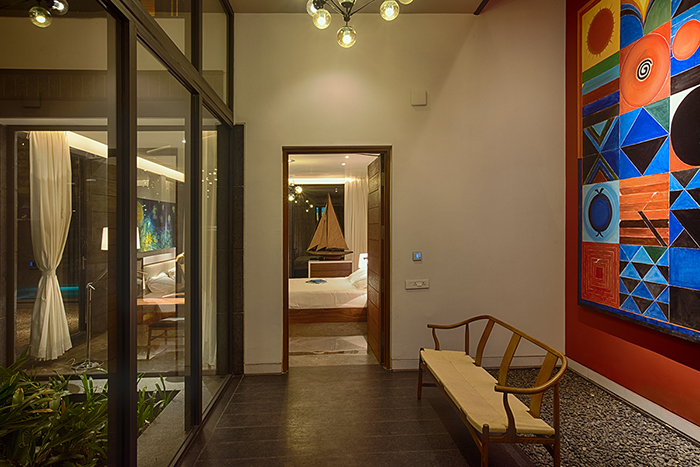 Lighting controls are programmed to create delightful transitions through different times of a day.